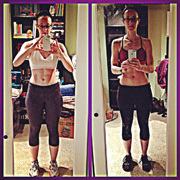 The before is when I first started the 60 day challenge way back in the fall. The after is as of now after the completing the program and going beyond the 60 days using the guidebook, and the love your jeans challenge. I admit that I missed some days here and there for the love your jeans challenge due to life just getting in the way, but there has never been a week without kettlebells…and I’m proud of that. I actually never wore skinny jeans until AFTER the 60 day challenge. I’d been avoiding them like the plague, thinking that a gal like me with a chunky lower body and a booty to spare could NEVER wear them. Boy, was I WRONG. I finally felt like I could give them a shot, and low and behold I…was…stunned. I absolutely adore my skinny jeans now, and have gotten rid of almost all of my non-skinny jeans. Ha! I’m looking forward to the new limitless challenge that starts Monday and will be using both the Body and scorcher Series DVDs! I’m inspired by all that you do, and you tackling your dreams and achieving them just motivates me to stay true to my goals as well. Thank you endlessly.